I arrived April 9 at Brgy. 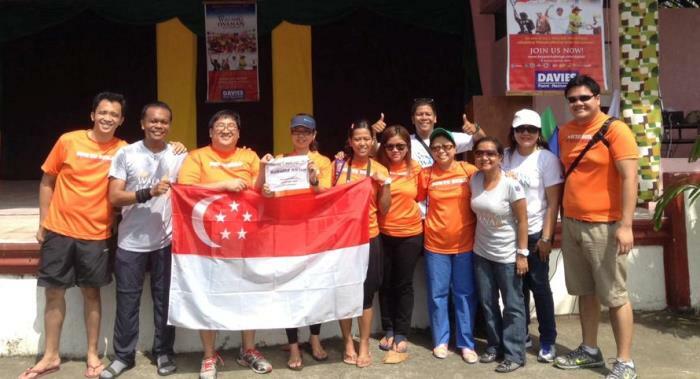 Fatima, New Washington, Aklan and 20 volunteers from SFC Singapore joined me there from April 12 – 16. Most of them were first-timers to Bayani Challenge but that didn’t stop them from giving their all in completing the tasks at hand. It challenged them to leave the comforts of their homes in Singapore and experience sleeping inside a classroom on just a sleeping bag, and to do manual labor under the scorching heat of the sun, such as digging the land in preparation for the foundation of the new homes that we would be building in the area. As part of the team’s annual tradition, they sponsored a Jollibee party for 150 kids on one of the days of the Bayani Challenge. They prepared loot bags, prizes for games and food for the kids. 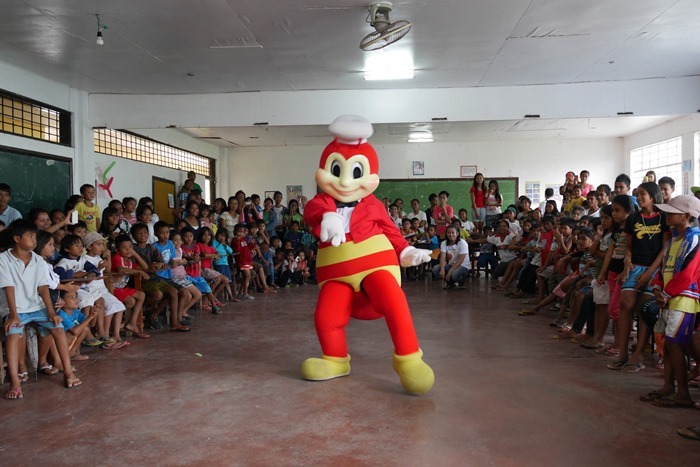 And of course no kiddie party would be complete without the Jollibee mascot adding to the fun and excitement of the kids. Seeing how they beamed with joy and anticipation when Jollibee entered the room and spent the next 30 minutes dancing and playing with them was simply priceless. That week, I witnessed how truly resilient the residents of our GK community are. 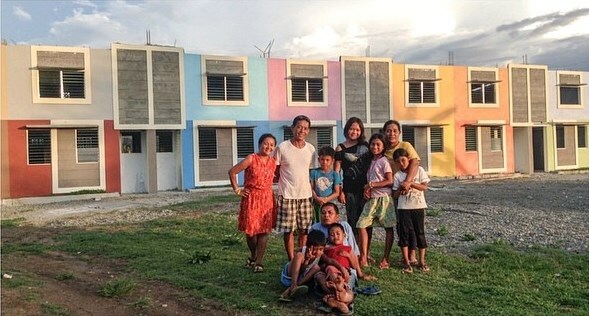 A few years ago, Typhoon Frank also hit the area that badly affected the 30 families living there. I had the privilege to spend time with some of them and they shared that when Typhoon Yolanda struck, the roofs above their heads were slowly being blown away and there was nothing they could do but pray to God for protection and safety of their family. Despite everything that happened, all I could see were their constant bright smiles and their hope that they will get through the storm together. I also felt how warmly they welcomed everyone who came to participate and how much they shared their selves to us. Their generous sharing of their personal stories of hope and of being heroes for one another affirmed me once again of the certainty that they will be able to get back on their feet again soon. The role of Partnerships Manager also allowed me to also participate during Week 2 of Bayani Challenge. I was scheduled to join our partners from Globe and Singtel in Bantayan Island, Cebu on April 22 for a Ceremonial Layering of Marker for the village that they are donating and also accompany them to Tambulilid, Ormoc, Leyte for their Bayani Challenge participation from April 23 – 25. Coming from the Holy Week break in Bacolod, going to Bantayan Island was just supposedly a 4-hour trip via bus and pump boat. But several (mis)adventures in between like the boat trip being cancelled and not being able to catch the next boat turned my supposedly 4-hour trip into a very exhausting 22-hour journey just to get to Bantayan Island by 9 AM in time for the program. It was a long day of travelling alone with my backpack and luggage bag, taking every mode of transportation available, from buses, tricycles, habal-habal and boat rides and taking a nap in between travels. To be honest, there were times when I just wanted to give up and not to travel any further but what kept me going were my fellow GK workers who checked on me from time to time. My biggest motivation was to make sure that I will be on-site when the partner arrives and complete my mission as the Partnerships Manager. I was greeted by a beautiful sunrise when I arrived in Bantayan Island, and it was God’s way of affirming me that it will be a great day ahead. A few hours after, our partners arrived and the program started. 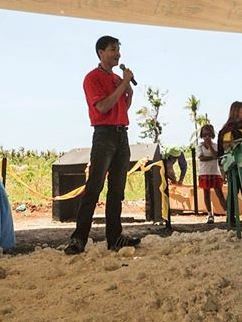 Boon Cheong, Director of Singtel’s Corporate Social Responsibility, addressed the residents and survivors of Typhoon Yolanda, saying, "Our day started at 5am but seeing all of you cheerful & strong, is worth it. 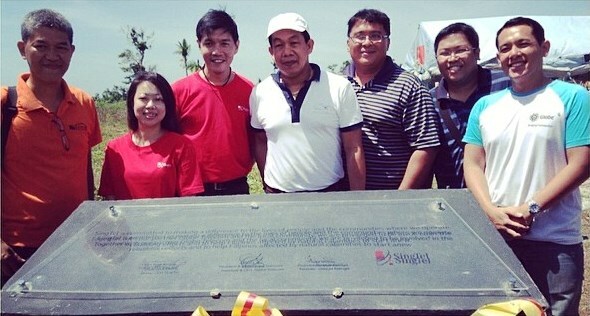 Singtel is committed to making a difference to the lives of people and the communities where we operate. Together with our partner Globe Telecom and the local community, we are privileged to be involved in the rebuilding efforts and to help Filipinos affected by natural calamities to start anew." We went back to Cebu City in the afternoon to prepare for their trip to Ormoc the following day. After we dropped them off at their hotel, I went straight to the pier for my 10-pm boat trip to Ormoc so that I can again be on-site before they arrive. That night, I was telling God that I only had one wish for the night and that is to be able to rest and sleep properly so I can regain the strength I need for the days to come. It was my first time to go to Ormoc and I was instructed to get a business class ticket to the slow boat that will bring me to Ormoc. Little did I know that business class would mean an air-conditioned room and a bed with a mattress. It was indeed a good night sleep and I thank the Lord for granting my simple wish. I arrived in Ormoc at 4am and had a few hours of rest before the partners arrived on site at 7am. There were 40 volunteers who came, 20 of them were non-Filipinos that came all the way from Singapore, Malaysia and Australia while the other 20 came from Globe office in Cebu. The day started with an orientation of the tasks that had to be completed on their Bayani Challenge participation. It continues to amaze me how Bayani Challenge brings together people from different walks of life, nationalities and even religion for a common cause of helping our nation especially the poor. Because of GK, people start to care for others and extend beyond the borders of geography and even time zones to work on a shared mission. The first two weeks of the Bayani Challenge was an affirmation of the greater work that we have ahead of us, a tall order to continue to challenge ourselves to give our all. 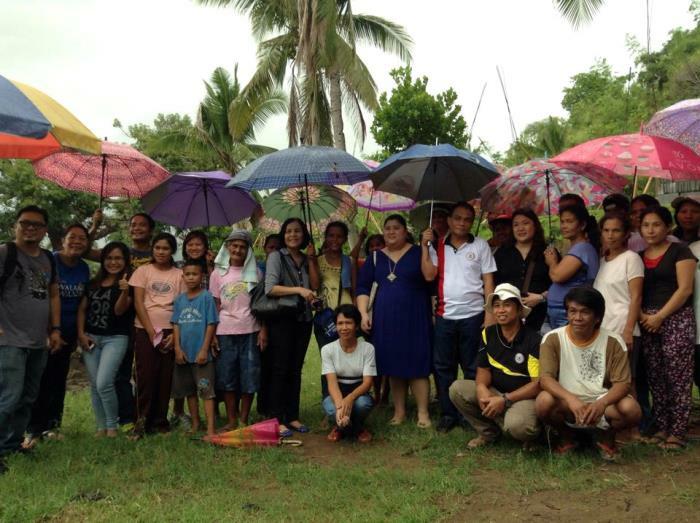 On the last day of Bayani Challenge 2014 last June 12, I was at Barbaza, Antique together with our partners from WPP Group of Companies for the ground-breaking of the GK village that they are donating. It took us 3 hours to travel to Antique from Iloilo and it was raining very hard when we reached the site but the survivors and would-be residents are waiting for us with their umbrellas, ready to shield us from the rain. We exchanged stories about how they were affected by Typhoon Haiyan and how they were working very hard to finish as soon as possible the required “sweat equity” to move into their permanent homes. It was a short visit that had a lasting impact not only on me but on our partners as well. When our partners meet the would-be GK residents! That afternoon, the partners headed back to Iloilo while I proceeded to New Washington, Aklan or so I thought. Nothing happens by accident. I instead found myself in Culasi, Antique. I was privileged to listen to the sharing of the service team when they were asked "Why are you here?" and I was simply humbled by the burning passion of the youth to serve God and our country. The future of the Philippines is indeed in good hands because of the young who are making the decision now to take part in building our nation! 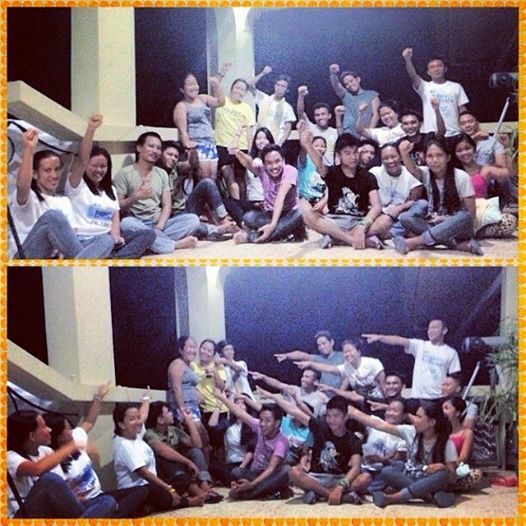 The love that I received from the bigger GK family that I am proud to belong to. My home away from home, my family away from family. 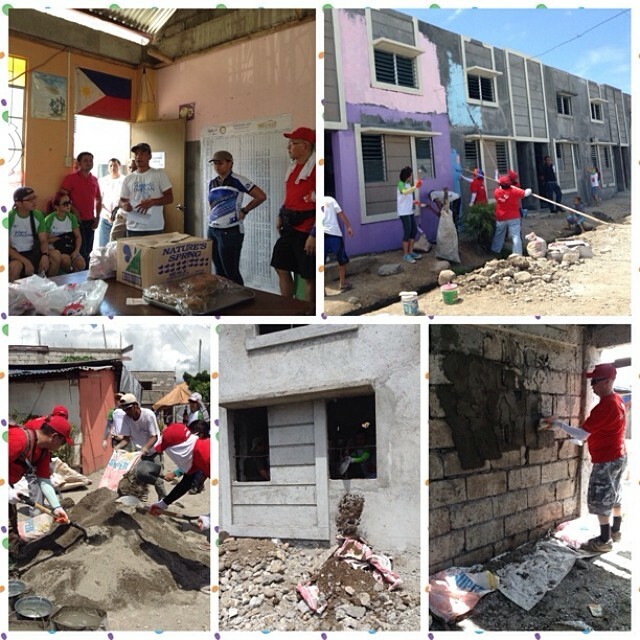 Last summer, over 1 MILLION VOLUNTEERS joined hands in rebuilding Aklan, Antique, Bohol, Capiz, Cebu, Eastern Samar, Iloilo, Leyte, Negros Occidental, Palawan, Samar and Zamboanga through Bayani Challenge 2014. This year, Bayani Challenge 2015 takes us to ~210 municipalities across ~55 barangays, bringing bayanihan and walang iwanan to the barangay level. Like Jaja, you too can share your stories. Share your Bayani Challenge experience. Send it to info@gawadkalinga.com.